Mail Order Dealers Association group. Join free. Brighton MI Red Hat chapter accepting new members. Join free. Welcome to the Tortoise Attraction Newsletter (also know as the tourist attraction) where you can find fun places to go in Michigan. 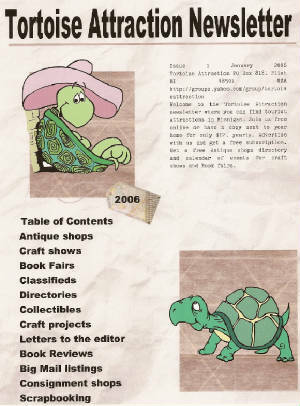 Antique Malls and Craft Fairs are listed in our Directories amoung other places of interest. Join our craft and hobby groups above. 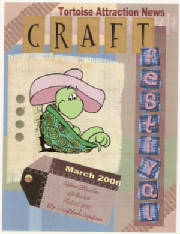 Buy and sell homemade crafts and post your classified ads free in the Craftybooks Adsheet online. But you don't have to be online to enjoy the fun. You can subscribe to our newsletter for only $12. & it will be mailed to you each month for a full year. Send check or money order to Tortoise Attraction PO Box 8181 Flint MI 48501.
no limit- as many 1"in CR's as you want only one dollar each. Free checking copy. Send your ad copy or 30 word ad to Craftybooks PO Box 8181 Flint MI 48501 and we will post it online for a full year! Co-op & exchange deals welcome. Mention this website in your publication and send copy along with your ad for equal exchange. Mail Order Directory can be found at http://groups.yahoo.com/group/mailorderdealers in our database. Add your mail order site free. Your ad in the Craftybooks Adsheet for one full year for only $12. Craftybooks Adsheet is online and mailed first class to other mail order dealers and interested persons. Includes free Big Mail List & Directory listings.